Oh, and budget friendly. Everything always has to be as budget friendly as possible because my life is expensive enough as it is. After looking through all the popular boots on the market like Premier Equine, Dalmar, Kentucky, NEW, etc, I settled on the Majyk Equipe XC boots. Several friends had them and loved them, and the boots were very reasonably priced at Riding Warehouse (especially with the USDF 15% off code!) plus they offer free shipping. This was actually my first ever purchase from RW, so thanks Majyk Equipe for starting what is now a pretty intense obsession. The total for the boots after the discount was $131 shipped – a pretty fantastic deal for XC boots. And I got a free RW hat out of the deal too. Bonus. Now that I’ve had the boots for 8 months and have been using them on a regular basis both at home and at shows, I feel like I can offer a pretty thorough opinion. The short version: I love them. I got medium fronts and hinds for Henry, because he is a bit on the fine boned side. 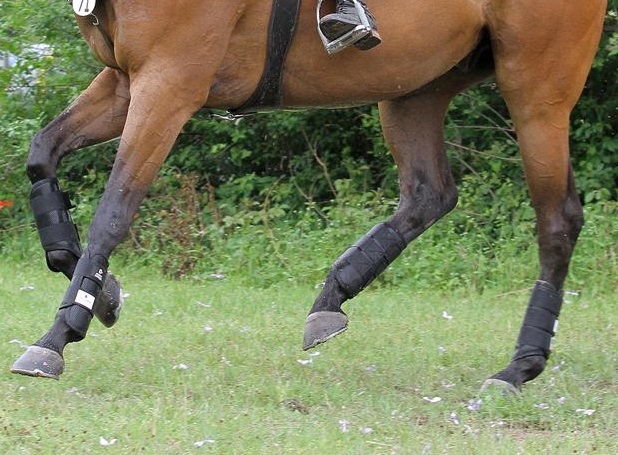 The boots are designed to be able to overlap on the sides, so it gives them a more flexible fit for different size horses. When I first got them it took me a few minutes to figure out how to put them on right. The trick is to find the guard inside the boot, line that up with where it’s supposed to lie (for the front boots the guard runs down the back over the tendons, for the hind boots the guard is in the front along the cannon bone) and then velcro them shut. Once I figured that out it made total sense. In case you’re extra slow, they’re clearly labeled. The boots are super lightweight and very breathable, and they hold absolutely no water. In the past I’ve always taped my boots for additional security but these don’t require it at all – the only times I’ve taped my boots has been purely for decoration (because sometimes you just need mac and cheese duct tape). They’ve never budged an inch. The lining is soft but not so squishy as to hold heat or water, and the perforated materials allow for maximum air flow. IMO they offer the perfect amount of coverage. They aren’t so big and bulky as to be cumbersome or restrictive while galloping, but they fully cover the cannon and the tendons, plus I absolutely love the construction of their shin/tendon guards. They will not shatter, and they’re strong and rigid yet not restrictive to the movement of the horse. As far as durability, the Majyk Equipe’s are holding up very well. I hose them off when they’re dirty and let them air dry – that’s it. There are no frayed spots or worn spots or loose threads… pretty sure if I took the effort to throw them in the washing machine they would come out looking brand new. I’m feeling pretty positive that these will last me quite a long time. Originally I didn’t really love all the tags on the straps and had every intention of taking a seam ripper to them, but honestly I love the boots so much that I’ve left the branding on. If me using them helps them sell more boots, great! They’re fantastic, and I want people to easily be able to see what they are. For the science geeks among us, you will probably really appreciate the research that has gone into the Majyk Equipe boots. There’s a whole page about it on their website, with a link to the full Biokenetics test results at the bottom. This is the kind of stuff I LOVE to see. They’ve made a really great product, and they can prove it. I’ve used them in the mud (quite a lot by now) and the scorching heat, and they’ve performed admirably in all conditions. In addition to all that fancy smancy impact testing they had done, I can attest firsthand to the fact that they really are non-slip, and they really are quite breathable. I would have bought these when I had Houston if they made gargantuan size but I think if I remember correct their hinds just weren’t going to work. Glad you love them so much! So my horse played in a creek yesterday and then half jumped over a puddle. Maybe someday we’ll go XC schooling when I stop being a pansy (like that will ever happen) and I’ll need XC boots. Those look so well ventilated which is such a nice change from a lot of boots. I’ve got the Majyk jumping boots. I’ve used them everyday for 3 years now, sometimes on multiple horses, and they’re just now starting to fray. Scrub a little bit, then stick them in the washing machine and they always look brand new. Really happy with that purchase! Definitely enjoy your blog. Am a new reader and not a horse person (but probably a wannabe). Impressed that you knew what a stitch ripper was 🆒 and how you might use it in your horse life. Proof that you heard (at least some) of what your mom has been talking about! 😄 Also enjoy your technical stuff – who knew horses wore boots! Let alone the variety of boots available. Looking forward to learning more and traveling along with you and Henry. Quality XC boots for $130 shipped new? OMG. It makes me want to buy XC boots and I don’t even XC. I have a set of the ME open fronts and have been REALLY impressed with them, especially at the price point they offer. Kudos to a great company! I know right? It’s so rare that the cheap option is also a really nice option. RW and ME for the win. Love mine. Mo whined about having hind boots on at all for awhile, but now he’s over it, and since he’s going to spend this year as an event horse I’m glad I have the best XC boots on the market. Everyone else around me is using Woofs and Nunn Finers, which I don’t love. 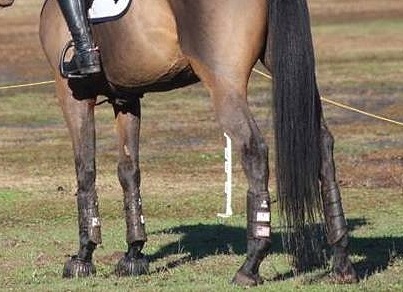 I put those on the other horses I ride because that’s what the owners want, but… blah. Hmm, I will have to look at these closer. I am in need of new boots because Gus really interferes with his legs and my woof boots don’t really fit him. I really love my Majyk Equipe XC boots too! I’ve had mine for a year now and they are still in excellent condition. After my experience with these I would definitely look into their other models! Thank you so much for this post!! Very high praise and I remember these boots being more expensive when they first came out. They’re more expensive from pretty much everywhere else. 😉 RW has the best deals. Your blog is very dangerous!!!! 😉 Because of you I have already bought a PS of Sweden bridle (and am totally in love with it <3) and now might be purchasing these XC boots!!! Though I keep telling myself I needed a new bridle and XC boots anyways 😉 hahaha!!!! !